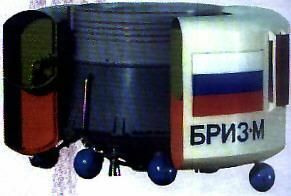 Earlier 8K82K model Proton, but Briz M storable propellant upper stage replaced the Block D cryogenic stage. AKA: 8K82KM;Proton KM;UR-500KM. Status: Retired 2003. First Launch: 1999-07-05. Last Launch: 2003-12-10. Number: 4 . Payload: 21,000 kg (46,000 lb). Thrust: 9,469.10 kN (2,128,738 lbf). Gross mass: 712,800 kg (1,571,400 lb). Height: 53.00 m (173.00 ft). Diameter: 4.15 m (13.61 ft). Span: 7.40 m (24.20 ft). Apogee: 185 km (114 mi). Family: orbital launch vehicle. Country: Russia. Engines: RD-253-14D14, 17D58E, S5.98M. Spacecraft: Raduga, Gorizont, Glonass, Spacebus 3000. Projects: Americom. Launch Sites: Baikonur, Baikonur LC81/24, Baikonur LC200/39. Stages: Proton K-2, Proton K-3, Proton M-1, Proton KM-4 Briz M. Agency: Chelomei bureau. 1999 July 5 - . 13:32 GMT - . Launch Site: Baikonur. Launch Complex: Baikonur LC81/24. LV Family: Proton. Launch Vehicle: Proton/Briz K/M. FAILURE: Second stage explosion.. Failed Stage: 2. Raduga - . Payload: Raduga s/n 45L. Mass: 1,954 kg (4,307 lb). Nation: Russia. Agency: RVSN. Class: Communications. Type: Military communications satellite. Spacecraft Bus: KAUR-3. Spacecraft: Raduga. Apogee: 30 km (18 mi). Carried a Russian Defence Ministry communications satellite. First attempted flight of the Khrunichev Briz-M upper stage in place of the usual Block DM. After the second stage explosion the remainder of the vehicle survived for 45 seconds before breaking up. Debris landed near Karaganda. As a result of this accident the Kazakh government suspended launches from Baikonur pending Russian agreement to pay back part of rent owed. 2000 June 6 - . 02:59 GMT - . Launch Site: Baikonur. Launch Complex: Baikonur LC81/24. LV Family: Proton. Launch Vehicle: Proton/Briz K/M. Gorizont - . Payload: Gorizont 45. Mass: 2,125 kg (4,684 lb). Nation: Russia. Agency: Svyaz. Manufacturer: Reshetnev bureau. Class: Communications. Type: Civilian communications satellite. Spacecraft Bus: KAUR-3. Spacecraft: Gorizont. Completed Operations Date: 2000-06-06 . USAF Sat Cat: 26372 . COSPAR: 2000-029A. Apogee: 35,798 km (22,243 mi). Perigee: 35,779 km (22,231 mi). Inclination: 0.30 deg. Period: 1,436.20 min. Burn 3, at second perigee, four hours after launch put the stack in a 369 x 34,988 km x 48.8 deg transfer orbit. The Briz-M then jettisoned its empty toroidal supplementary fuel tank. Burn 4, ten hours after launch, placed Gorizont No. 45L in near-geostationary orbit. Gorizont No. 45L was expected to be the final launch of that model of television broadcasting satellite. It carried 6 C-band transponders, one L-band, and one Ku-band transponder. The newer Ekspress satellites are replacing the system. Stationed at 145 deg E. Positioned in geosynchronous orbit at 145 deg E in 2000. As of 5 September 2001 located at 145.25 deg E drifting at 0.002 deg W per day. As of 2007 Mar 10 located at 144.69E drifting at 0.019W degrees per day. 2003 December 10 - . 17:42 GMT - . Launch Site: Baikonur. Launch Complex: Baikonur LC81/24. LV Family: Proton. Launch Vehicle: Proton/Briz K/M. Cosmos 2402 - . Payload: Glonass 794. Mass: 1,415 kg (3,119 lb). Nation: Russia. Agency: KNITs. Manufacturer: Reshetnev bureau. Class: Navigation. Type: Navigation satellite. Spacecraft: Glonass. USAF Sat Cat: 28112 . COSPAR: 2003-056A. Apogee: 19,314 km (12,001 mi). Perigee: 19,018 km (11,817 mi). Inclination: 65.10 deg. Period: 677.20 min. Three navigation satellites of the GLONASS system were launched to replenish the constellation. This was the fourth end-of-year replenishment launch since 2000..
Cosmos 2403 - . Payload: Glonass 795. Mass: 1,415 kg (3,119 lb). Nation: Russia. Agency: KNITs. Manufacturer: Reshetnev bureau. Class: Navigation. Type: Navigation satellite. Spacecraft: Glonass. USAF Sat Cat: 28113 . COSPAR: 2003-056B. Apogee: 19,102 km (11,869 mi). Perigee: 18,963 km (11,783 mi). Inclination: 65.10 deg. Period: 671.90 min. Cosmos 2404 - . Payload: Glonass-M 701. Mass: 1,480 kg (3,260 lb). Nation: Russia. Agency: KNITs. Manufacturer: Reshetnev bureau. Class: Navigation. Type: Navigation satellite. Spacecraft: Glonass. USAF Sat Cat: 28114 . COSPAR: 2003-056C. Apogee: 19,104 km (11,870 mi). Perigee: 18,961 km (11,781 mi). Inclination: 65.10 deg. Period: 671.90 min. Improved version of the Glonass satellite..